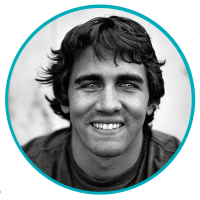 Greg Long is often referred to as “the best young big wave surfer on the planet.” Born and raised in San Clemente, and despite success in the amateur ranks, Greg took a turn away from traditional pro surfing, to pursue his passion for surfing huge waves. In 2003 at the age of 19 he won the Red Bull Big Wave Africa, and earned an invite the following year to the Mavericks Surf Contest, where he placed second in 2005, and won the event in 2008. In 2008 he also earned an official invitation to the “Eddie Aikau” big wave event held at Waimea Bay, which he went on to win in 2009. Greg has become one of only a handful of surfers in the world to be invited to all three major big wave paddle events. Greg’s commitment to the coastal environment began at an early age, and in addition to working with Save The Waves, he’s been actively involved with groups such as Surfrider, Wildcoast and San Onofre State Parks. He’s been particularly concerned with coastal development issues in Baja, where in 2005 he witnessed the destruction of Harry’s, one of his favorite big-wave playgrounds, buried from construction of a Liquid Natural Gas facility owned by Sempra-Shell.